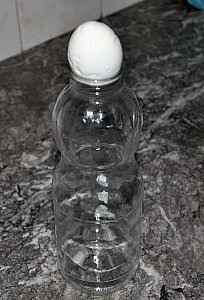 This egg in a bottle experiment is a fun activity for kids to watch, predict and observe but an adult should do the actual experiment. First you will need a hard boiled egg. Cool and peel the egg. Then follow the directions below. Find a glass bottle with a hole slightly smaller than your egg. The adult should light a strip of paper with a match and place in the glass bottle. Immediately place your peeled hard boiled egg on top of the hole. Place the thin side down making sure the egg forms a seal with the opening. Predict what you think will happen. The egg will get sucked into the bottle. Why? Because the heat from the flame causes the air to expand, and the pressure inside the bottle becomes greater than outside the bottle. Some of the expanding air escapes around the egg as a result. When the air inside the bottle cools and contracts, there is less air inside the bottle than there was at the beginning so the pressure inside the bottle is less than the atmospheric pressure outside the bottle. The outside air pushes the egg into the bottle. This is the same principle used when canning.